I was looking for a place we hadn’t visited before in Bromley to have Sunday lunch with some friends. Someone in my family had suggested The Bricklayers Arms previously (they had eaten there – not a roast dinner, but something during the week). 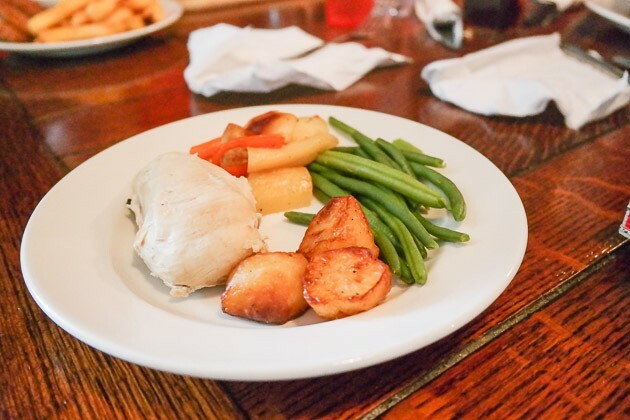 We have had some nice Sunday lunches in Shepherds Neame pubs previously, so seemed like a good choice – I gave them a call and booked for a couple of weeks time for 4 adults and 3 children. Parking was easy, there were some spaces outside on the side road (being a Sunday, we could park in them). Upon walking through the doors, we were met at bar and shown to our table at the back, near the kitchen. Being a Shepherds Neame pub, there was a good selection of beers. I ordered a Whitstable Bay and a Sam Adams was also ordered. For one of the kids, we also asked for a Capri Sun. Claire asked for a diet Coke. We skipped starters and went straight to main course. We ordered JW, our toddler with wheat, gluten and dairy free allergies, a roast chicken (they were good with accommodating). Claire and I both ordered a roast beef. 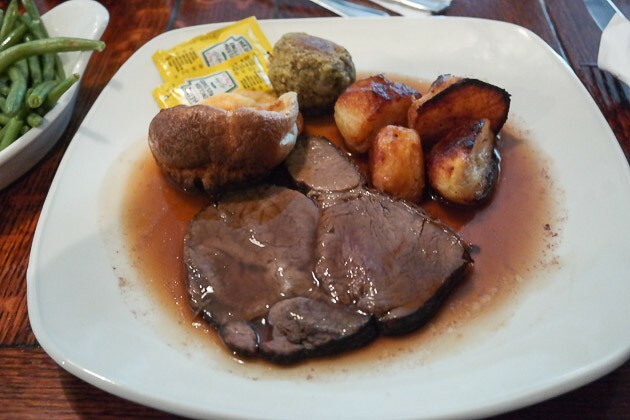 Food came out quickly – the roast beef was certainly cooked all the way through! We had 4 roast potatoes, a small Yorkshire pudding, stuffing and gravy, with carrots, cabbage, green beans and parsnips in their own dish. The beef, due to the fact it was very well done, was quite tough to eat. The roast potatoes were not crispy at all, but quite nicely seasoned (lots of salt and pepper). 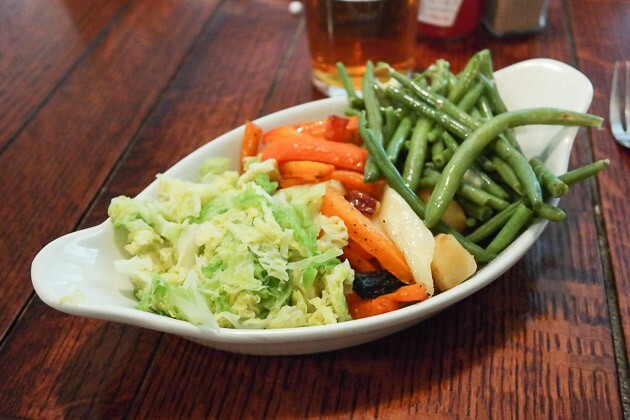 The vegetables were “ok”, a bit floppy and not much flavour but Claire liked the parsnips. The Yorkshire pudding was ok, and the stuffing was quite nice. The gravy was nice, a bit thin but very flavourful. Ultimately a local pub lunch. The high chairs were clean and in good repair. The staff were friendly towards the children and we were made to feel welcome as families. It was good they had a children’s menu – and offered a kids Sunday lunch. We didn’t need to use any baby changing facilities, so couldn’t say whether they had any available. The Bricklayers Arms was definitely a local pub – the Sunday lunch was at best “ok” but the service was very friendly and they had a great selection of drinks available. The parsnips were quite nice, as was the gravy. We also appreciated the staff being friendly with our toddlers / baby. 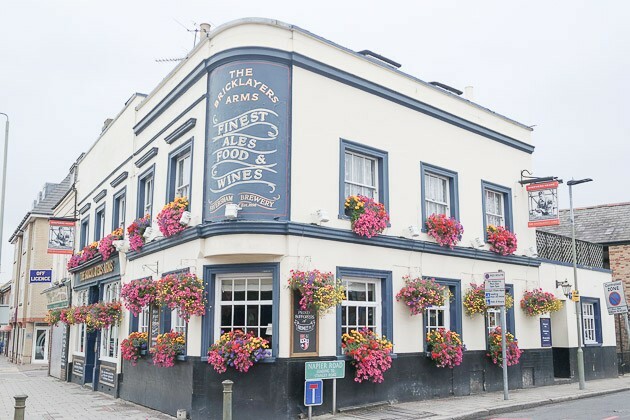 As this website is not just about the Sunday lunch, but also about the service and drinks, The Bricklayers Arms scores 2.5 / 5 – I’d probably recommend popping somewhere else for lunch, but a great place to settle down for a quiet beer. It was refreshing having a bill so cheap though!